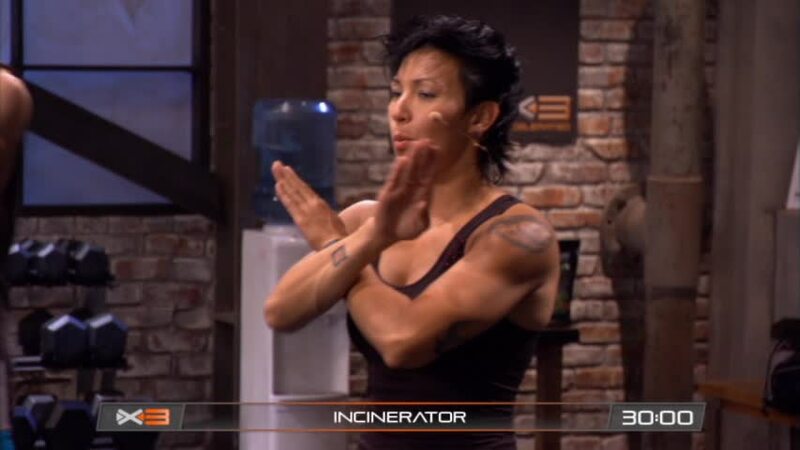 Although one of the most underused routines in the P90X3 schedule, Incinerator will more than likely become one of everyone's favourites. 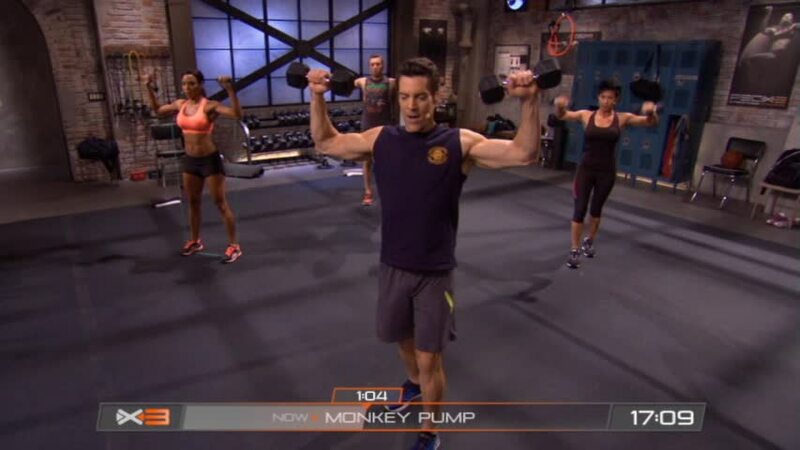 This routine uses weighted resistance exercises, alternating with body weight "burnouts." A common theme with P90X3, this routine, like so many of the others, wastes very little time throughout. You get a tremendous upper body workout in just 30 minutes. 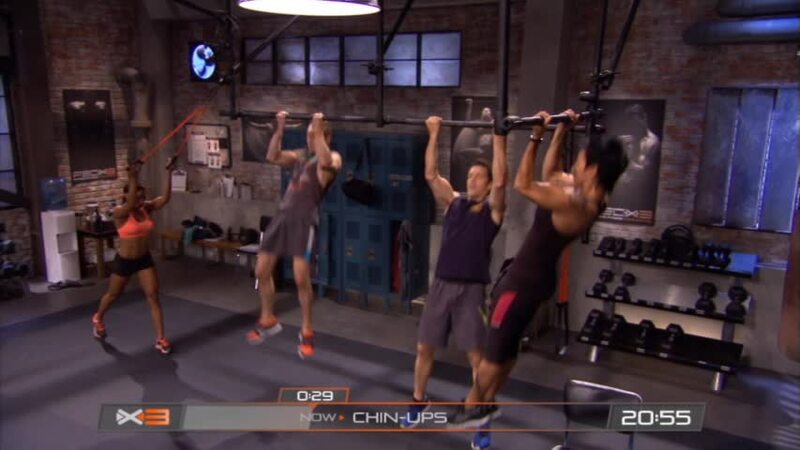 The workout design is something that should be relatively new to fans of Beachbody. Although working out at home has you using a lot of body weight exercises, the layout and design of this routine make this one very enjoyable by having a weighted exercise followed by a body weight exercise attacking the same muscle group. This routine has my vote as one of the best "Burnouts" at the end of the routine. Almost every P90X3 workout has a set list of exercises, but then you tend to do one final "Burnout" round during the last minute or two of the workout. The burnout in this routine certainly is something! I understand the desire to do this workout with as little equipment as possible, but some of these exercises, the dumbbell chest work to be specific, could use a bench to maximize range of motion. So although I have this listed in the cons section, it really is more of piece of advice for those of you with a workout bench at home. Obviously not a knock against the routine itself, but more so about the scheduling. It is too bad that this routine only appears three times in the Classic, Doubles, and Lean schedules. I know I will be using it many times in future hybrid schedules. I found the "Hail to the Chief" exercise to be a little tough on my shoulders. You are essentially doing a tricep extension with a flared elbow, so I personally found it put lots of strain on my rotator cuff. This may be something some of you also watch out for. Like most workouts, this routine is only going to be as difficult as you make it. The weighted resistance exercises are set at 10 repetitions. It may take you one or two rounds of this workout to get your weights set, but you should be aiming for a weight that will have you struggling to reach 10 repetitions. When you combine weighted resistance exercises and then follow them up with essentially max-repetition body weight work on the same muscle group, in my opinion, it is pretty hard not to get worked over. By maxing your resistance and then maxing your repetitions on the same muscle group, in such a short period of time, this one will not only have your muscles pumped, but your heart rate soaring as well. Great routine! 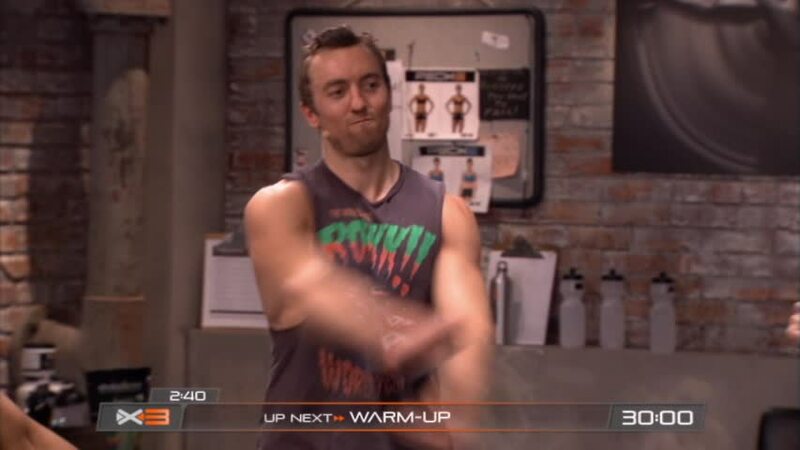 A very quick P90X3 warmup (Cold Start available on the DVD if needed). Workout is 18 total exercises, no repeats, with a Burnout round at the end. The burnout is 2 minutes long just so you know! Check the video above to see the sequencing of exercises, but basically you perform a weighted resistance exercise for 10 repetitions (renegade row, for example) followed by a body weight exercise attacking the same muscle group (standard pull-ups - lats). The body weight exercises are timed, although they are essentially max repetitions. As I mention in my video, I believe this workout will end up being a favourite for many doing P90X3. I know that for myself, and probably the same for many others, that I will be including this routine in future hybrids for quite some time. Comment: Try and prevent your torso from swaying or twisting too much from side to side. Place your feet nice and wide to give yourself a stable base of support. 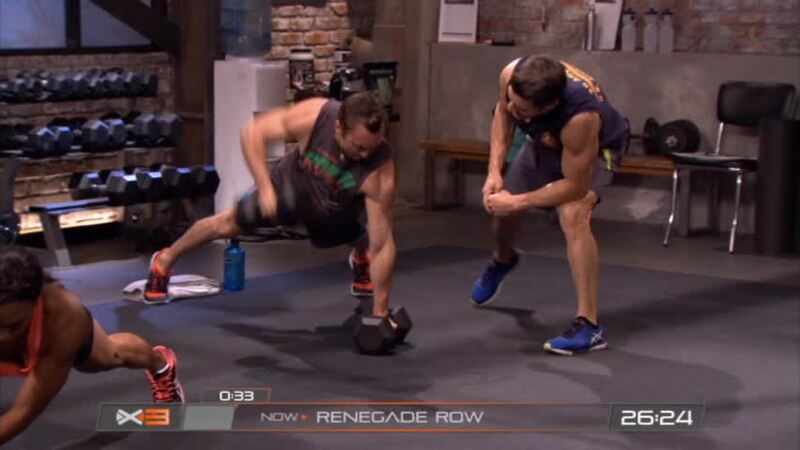 When one arm is rowing, press down into the other dumbbell to stabilize. Secondary Muscles: Biceps Brachii, Trapezius - Transverse Part, Rhomoid Major, Rhomboid Minor. Secondary Muscles: Brachialis, Brachioradialis, Biceps Brachii, Teres Major, Levator Scapulae, Trapezius - Ascending Part, Pectoralis Minor. Comment: Keep a slight bend to your elbows throughout the movement to help protect your shoulders. Comment : Both upper and lower body must be kept straight throughout movement. For lower intensity, knees can be on the ground, or hands can be elevated to a chair or bar. The higher the bar, the less resistance needed (easier the exercise). To intensify, elevate feet or place (secure) weight on back. Comment: A good strong base of support is key here. Aim for a strong lower back and straight torso throughout. Do not let your body "kip" to bring the weights up as this could injure your lower back. Comment: Pinch your elbows close to your torso here to put more emphasis on your triceps as well as stabilize the shoulder joint. Primary Muscles: Pectoralis Major - Sternocostal Part. Comment: Keep your elbows close to the side of your torso throughout the full range of motion. Do not let them flare out to the side like a standard push-up. Both upper and lower body must be kept straight throughout movement. For lower intensity, knees can be placed on the ground, or hands can be elevated to a chair or bar. The higher the bar, the less resistance needed (easier the exercise). To intensify, elevate feet or place (secure) weight on back. Primary Muscles: Pectoralis Major - Sternocostal Part and Abdominal Part, Triceps Brachii - Lateral, Longus, and Medius. Comment: Besides during the overhead pressing, maintain and 90 degree elbow bend and keep your upper arms parallel to the floor throughout the scarecrow rotation and bringing the elbows together in the front. Primary Muscles: Deltoid - Clavicular, Spinal and Acromial Part. Secondary Muscles: Trapezius - Transverse and Ascending Parts, Serratus Anterior, Pectoralis Major - Sternocostal Part. Comment : To intensify this exercise, place feet on a higher (but stable) surface. Both the concentric and eccentric actions should be done in control. Comment: Light resistance here, even if you can usually lift more weight than what you are using because the eccentric action should be slow and in control. Primary Muscles: Deltoid - Posterior Part. Secondary Muscles: Trapezius - Transverse and Ascending Part, Serratus Anterior, Supraspinatus. Comment: The range of motion here should cause your shoulders to go beyond what you would see in a low plank. Your shoulders should travel past your elbows and directly over your hands. Comment: Keep the weights or band handles hugged close to your torso throughout the movement. 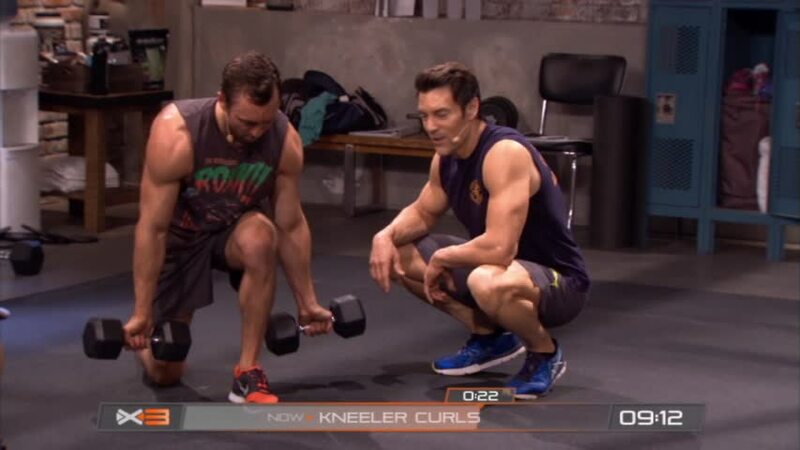 Curl the resistance right up to your shoulders. Comment: Decrease the distance between your torso and front, bent knee. Your torso should be leaned over to concentrate the intensity on the biceps. Comment: One arm performs the action at a time. Make sure to slowly control the descent of the weight so that you are not dropping it on your shoulder/chest/face. Secondary Muscles: Deltoid - Posterior Part. Comment: Try and keep your upper arms parallel to each other so that your elbows do not flare out to the sides too far. To intensify, try placing your feet in different positions whether they are further away from you (straight legs) or on a chair/bench at varying heights. 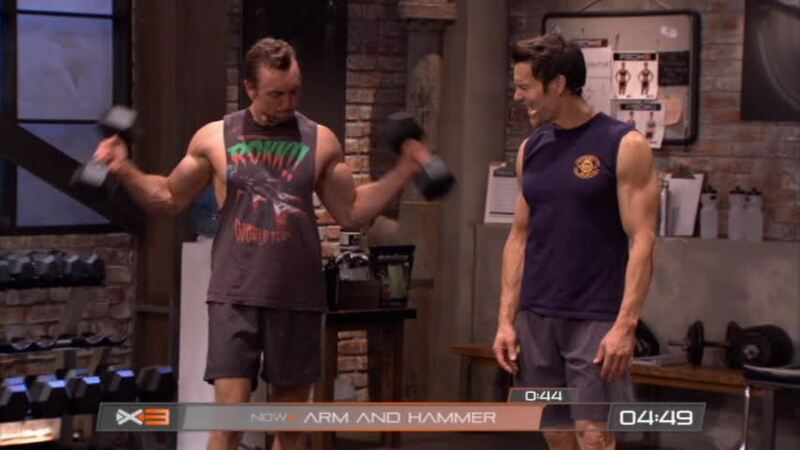 Comment: Two very distinct bicep movements here. The first movement is a traditional bicep curl, palms facing up, weights remaining parallel to the floor. Once returned to their original position, perform an outward hammer curl so that the weights travel perpendicular to the floor. Comment: Since we are working the backs of your upper arms, hinge at your elbows only and do not allow too much movement from the shoulders. Your upper arms (shoulder to elbow) should remain parallel to the ground. A very enjoyable upper body routine that covers a bit of everything. You get a tremendous amount of work done in a short period of time. This is a rocker of a routine that I am sure many of you will love. I know it is quickly becoming one of my favourites! When should you add Ab Ripper X/X2/X3 into the P90X3 schedule?